Al-Shabab militia patrol a market in Mogadishu, Somalia, in October. 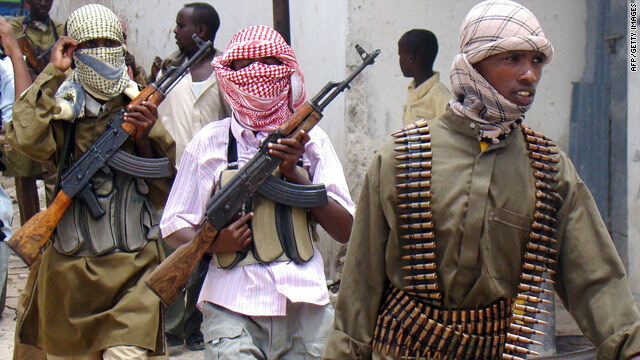 (CNN) -- A militant Islamist group associated with al Qaeda has for the first time threatened to attack Israel, far from its normal base of operations in Somalia. Al-Shabab, which is fighting to control the east African country, accused Israel of "starting to destroy" the Al Aqsa mosque, where standoffs have taken place recently between Israeli police and Palestinians. The mosque is part of the complex that Jews call the Temple Mount and Muslims call Haram al-Sharif. "The Jews started to destroy parts of the holy mosque of Al Aqsa and they routinely kill our Palestinian brothers, so we are committed to defend our Palestinian brothers," said Mukhtar Robow Abu Mansur, a prominent Al-Shabab commander. His threat was part of a series of fiery sermons delivered after Friday prayers in Baidoa in southwest Somalia. Al-Shabab controls the region, which is part of a country that has been without an effective national government for nearly 20 years. Other leaders of the group also threatened Israel, the first time the group is known to have done so. "We will transfer and expand our fighting in the Middle East so we can defend Al Aqsa mosque from the Israelis," Al-Shabab commander Abdifatah Aweys Abu Hamza said in Mogadishu, the Somali capital. He is apparently the leader of a new Al-Shabab armed group calling themselves "Mujahedin Al Aqsa," or "Al Aqsa Holy Warriors," which they said is assigned to attack Israel. It is not clear whether Al-Shabab has the capacity to carry out its threats against Israel. But Rashid Abdi of the International Crisis Group, speaking last week before al-Shabab issued its threats against Israel, warned that the group should be taken seriously. "We should not underestimate the capacity of Al-Shabab," he said. "This is a deadly organization, a formidable foe." Abdi said the group had been mutating from a nationalist group into a terrorist organization more like al Qaeda, which was behind the September 11, 2001 attacks on the United States. "If you look at the rhetoric and language and if you look at the Web sites, if you hear their preachers or their scholars speak, it is completely indistinguishable from al Qaeda leaders," Abdi said. The group has also become more vicious in Somalia, a local human rights expert said. "The most gruesome and gross violations of human rights are committed by Al-Shabab," activist Hassan Shire Sheikh said. "They have also instilled fear. They just shoot, they kill, they maim and they lash." The group also threatened African neighbors on Friday, including Ethiopia, Djibouti, Kenya, Eritrea, Ghana, Sudan and Uganda. They have in the past threatened African nations that provide peacekeeping troops to the war-torn country. The U.S. State Department Country Reports on Terrorism from April lists Al-Shabab as a terrorist organization and blames it for shootings and suicide bombings inside Somalia. It does not list the group as having carried out violence outside Somalia, but says some members of the group have trained and fought alongside al Qaeda in Afghanistan. The transitional government has struggled to establish authority, challenged by Islamist groups like Al-Shabab that have seized control of Mogadishu and much of the south.